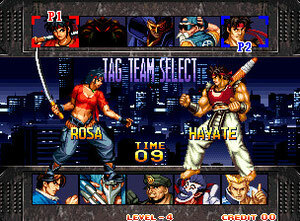 Play King Leo & Jyazu: Put the cursor on the following characters on the selection screen: Rosa, Kim, Mezu, Kim, Rosa, Gozu. Theb turn around the table counterclockwise until you go on Gozy. Press D. Then, enter Up on Gozu to select Jyazu and Up on King Lion to have King Leo.